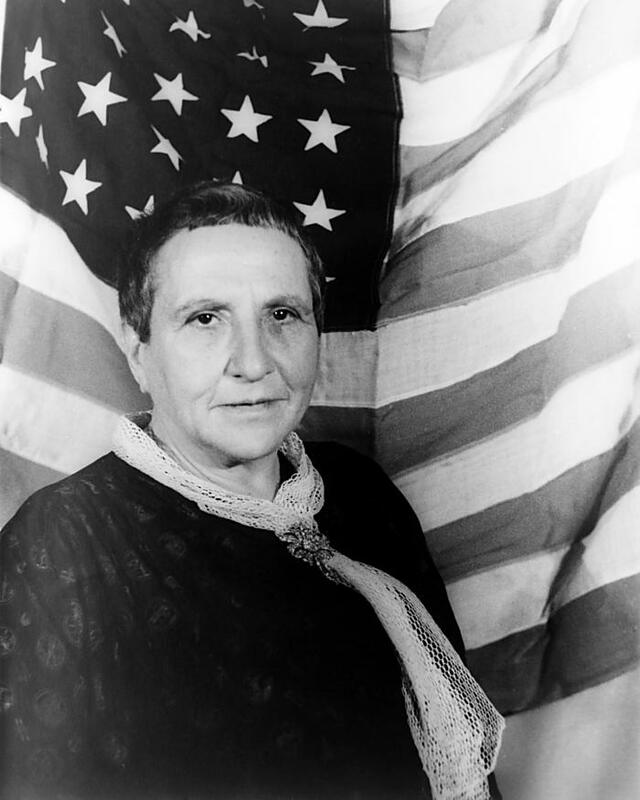 Although Gertrude Stein is remembered as an innovative, somewhat outlandish American poet and writer of prose, she actually spent the last 43 years of her life as a leading light on the Paris art scene where she lived from 1903. 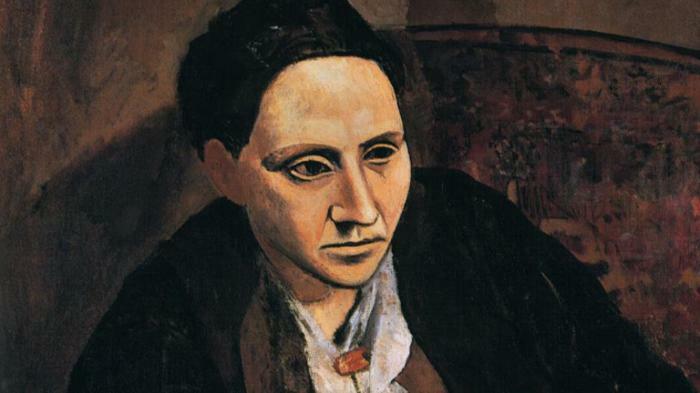 She was an avid collector or fine art and her salon in central Paris was well known as a meeting place for the “new moderns”, painters such as Henri Matisse, Juan Gris, and Pablo Picasso. Stein saw in these new artists a raw talent that she tried hard to emulate in her writing. Although she had a high regard for her own writing it was often seen as hard to fathom, often containing no discernible plot or rhythm. 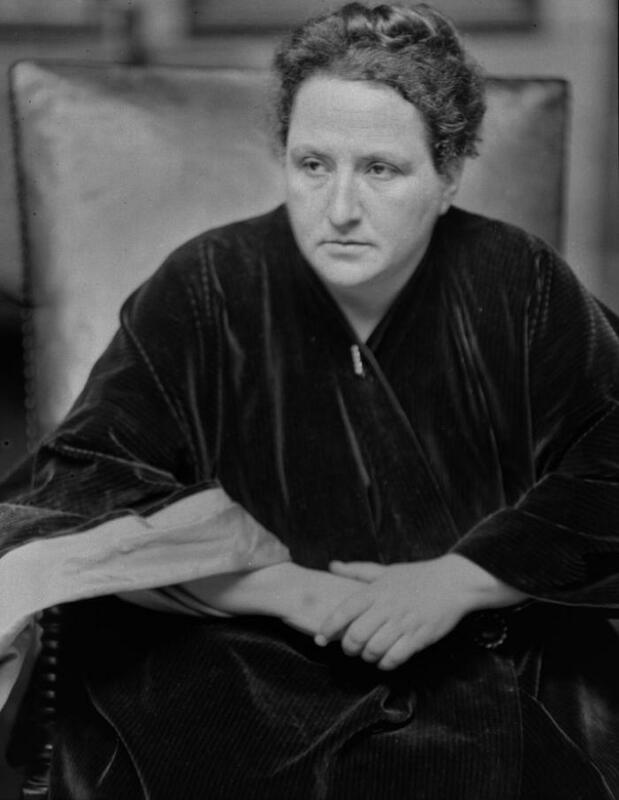 She was born in Pennsylvania in February 1874, the youngest of five children in an upper class German-Jewish family. Her father had made a fortune in railroad and streetcar investments. The family relocated to Oakland, California when Gertrude was four years old. While in her teenage years she lost both parents and her elder brother Michael assumed control over the family’s affairs, sending her to live with their mother’s family in Baltimore. It was here that she first experienced the art world and the Saturday evening salons that she attended became her inspiration for what she created later in Paris. 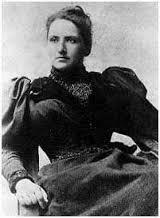 At Radcliffe College, from the age of 19, she became a psychology student and embarked on experiments into Normal Motor Automatism. This was a study into how humans cope with two normal, intelligent activities at the same time, such as speaking out loud and writing. She later stated that it was impossible for human beings to write “automatically” as it was far too complex an activity although a behavioural psychologist assessed her work Tender Buttons, written in 1934, as a possible example of “normal motor automatism”. Stein produced work that was often said to represent the “stream of consciousness,” theory that was also attributed to later modernist writers such as Virginia Woolf and James Joyce. Here is an example of her work, a poem called America. In truth, it’s hard to understand what it is about! The year 1903 saw her move to Paris, living for the first eleven years with her art critic brother Leo. 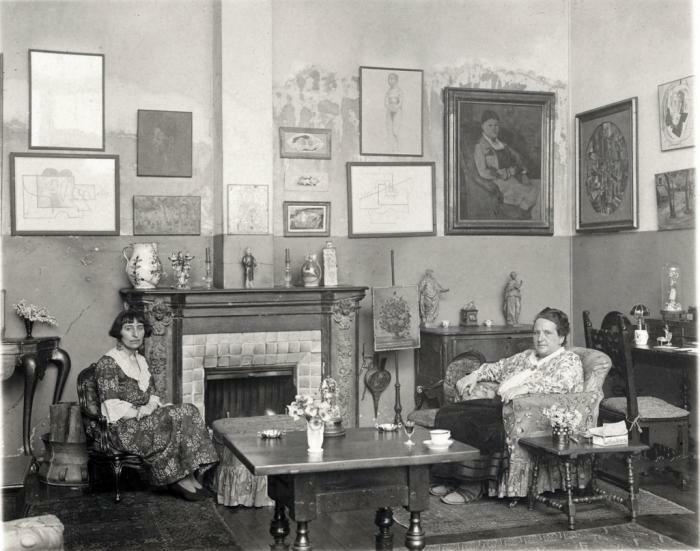 From now on she devoted herself to the Paris art world and became one of its central figures, along with her lifelong companion Alice B.Toklas who also acted as her secretary. 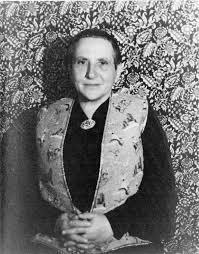 She continued to write but produced nothing that sold in any great numbers until The Autobiography of Alice B. Toklas was published. It was a departure from her normal style of writing, being a conventional composition. 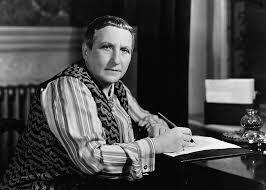 Unusually, though, it was actually the story of Gertrude Stein but written in the person of Toklas. 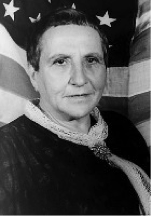 Her status as an American of German-Jewish origin probably helped her survive both world wars and she did much voluntary work in 1916, ferrying supplies around the French hospitals. 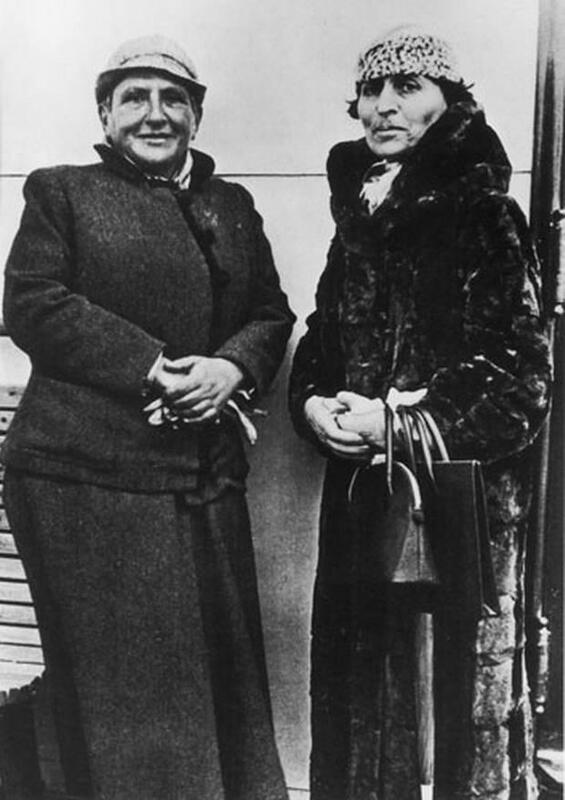 During the second world war she and Alice used the good offices of Bernard Faÿ, a Vichy regime collaborator, to stay safe. Her somewhat unbalanced view of the German war effort was lampooned in her book Wars I Have Seen where she compared their efforts to those of the American comedy act The Keystone Cops, although these views were published before the end of the war and subsequent Holocaust revelations. 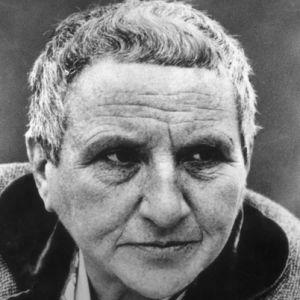 Not much of Gertrude Stein’s literary output could be said to be memorable but she left her mark, nonetheless. An unsuccessful fight against stomach cancer claimed her life in July 1946. She died at the age of 72 and was buried in Paris.